Today's review is the book "Daddy Dates: Four Daughters, One Clueless Dad, and His Quest to Win Their Hearts: The Road Map for Any Dad to Raise a Strong and Confident Daughter" by Greg Wright. When faced with the reality of raising four (4!) teen daughters, Greg Wright went on a soul quest. He came back with a mission: Don’t Screw Up. This funny, insightful, and relatable book poses the wildly original concept that should be a “duh” for most dads—but isn’t: In order to raise a confident woman-to-be, show your daughter what it feels like to be treated with love, respect, and true interest by a man who loves her. The two-day event location closest to me was held at Philips Arena in downtown Atlanta, GA. It featured talented guests with powerful stories of faith. Our speakers were Sheila Walsh, Lisa Harper, Luci Swindoll and Angie Smith. We had the pleasure of drama by Nicole Johnson and special guest Steve Arterburn, who created the event. The musical guests were Natalie Grant (she rocked it! ), Laura Story (she sang "Blessings" for us! ), and Mary Mary (they had the arena dancing!). Through a mutual friend, I connected with a ladies group from a nearby church who were also going to Women of Faith. They welcomed me warmly and we bonded over the weekend. It is hard for me to open up to other people, but because of my experience at this event, I feel like I have been broken of that. As I learned from Mr. Arterburn during the Women of Faith event, positive female relationships were not modeled for me by my mother. Wow, did he nail it with that one. Just one of many things said during the event that resonated with me, I realized that I have the responsibility as a parent to be the positive role model for my children, even if they weren't modeled for me. 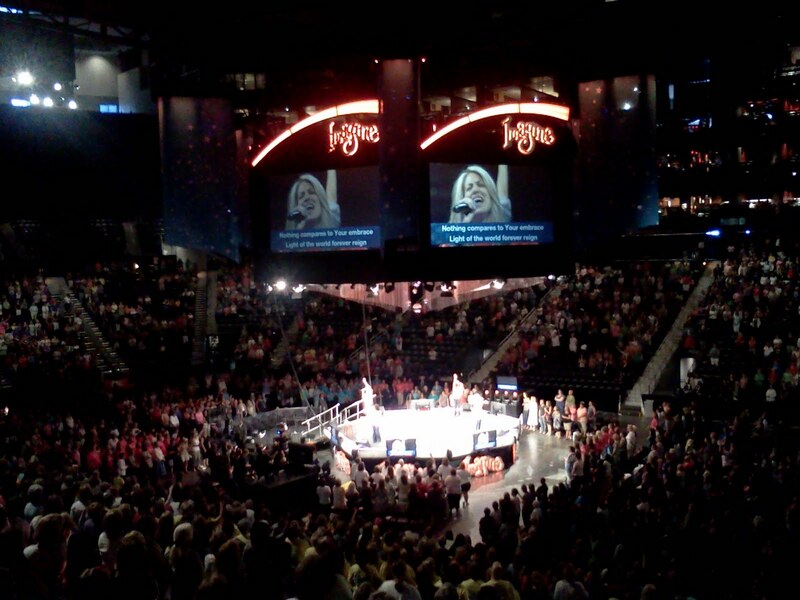 Women of Faith was so much more to me than a blogging opportunity. I took a step out of my comfort zone and my life is so much richer for it. During my time at the event, I was touched by the stories and strength of the women. There were times when we cried, laughed and were amazed. There was never a dull moment, especially traveling with my new friends. Between the event and spending time with them, this was one truly amazing weekend. I left refreshed, rejuvenated, and inspired. I am looking forward to attending next year! Want to see where Women of Faith is coming your way? Check them out here. I am also following them on Facebook and Twitter, loving their daily inspirations. Disclosure: I was provided tickets through Booksneeze.com to attend the Women of Faith event and write about my experience. No other compensation was received. Opinions in this post are solely mine.